1 - Meet the Modder: Tim 'Hukkel' Warning 2 - Show Us the Workshop! Hello again, everybody, and welcome to the next instalment of Meet the Modder, where we get to have a closer look at what makes some top modders tick. The last edition featured Mike Petereyns back in November 2017, so with a new year upon us it seemed fitting to catch up with another familiar face. Step up to the podium, Tim Warning, aka Hukkel here on bit-tech and known for Dutch Lion Customising online. Tim's been a regular poster here since 2013, and his rigs have graced the likes of Mod of the Month/Year on multiple occasions. 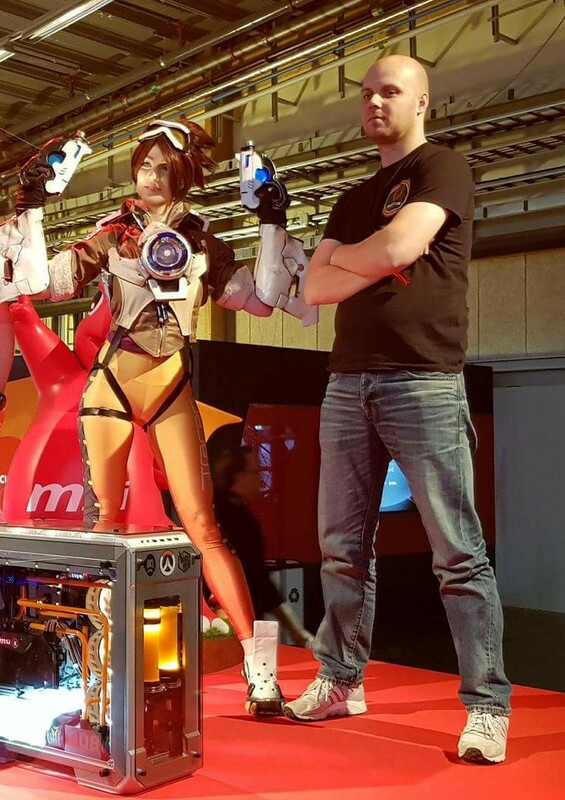 Similarly, he's competed in modding contests around the world and is generally just an awesome guy to be around. I recently got to spend some time with Tim when he was in London. In between stuffing our faces with wonderful food and sticking fingers into some fancy PC hardware (more on that later...), I got to sit down and ask a few questions. So, who exactly are you, and where do you hail from? Have you been modding for long? My name is Tim Warning. I have a case modding page under the name of Dutch Lion Customising, and on bit-tech I can be found under the nickname Hukkel. I live in The Netherlands and have been modding PCs for about six or seven years or so. What got you into modding in the first place? About 10 years ago, I had never put together a PC myself. A friend showed me some YouTube videos and helped me out with picking parts, etc. And against all odds it actually worked! Then I did a few systems for others, but for my brother-in-law I wanted to do something more. I had seen some case mods made by others, the first DIY brackets to fit an AIO water-cooler to a graphics card and Lutr0 cable sleeving online, and I wanted to try it out. That is how my first case mod came to life, and it's when the modding bug bit me. I became hooked! Haha, that's certainly a familiar tale; I think many of us can attest to being inspired to take up modding after seeing the possibilities presented online. For your modding work, what would you say are the three tools that you find absolutely essential? In my mods you see a lot of acrylic panels being laser-cut and engraved, but I actually would name my jigsaw. I still do a lot with it, just not the finer things, but the jigsaw is definitely the first. The second thing would be the tools I use to create my own cables and sleeve cables that already exist. Nowadays you can order very nice custom ones online, but I always end up making those last few ones for Molex or SATA in the correct length and special-length fan cables/extensions. The third tool would be my battery drill, just to make holes in panels to fit reservoirs, start an opening for the jigsaw, or to mount panels or reservoirs, etc. I can 100 percent get behind those choices; it's amazing how much of a difference it can make being able to craft your own cables where needed. This may be a difficult question given you've done so many, but which of your mods would you say is your favourite? I can imagine how serious that build must have been when it was completed, and I remember following the thread avidly! With so many builds going on, where do you draw your inspiration from? It's not easy coming up with ideas when deadlines can be tight! Basically from everywhere. It can be from other case mods, a video game, from an industrial design used on a car or a building, or even just a single shape. I love industrial and minimalistic design, especially angular at the moment. I create case mods for me just for fun but also a lot for specific events, which come with requested themes like esports-related or specific brands, etc. I have never done a theme I don't like myself. It might be that the end result is more suited to attract a crowd at a big event than having it in your home, but I have never sent something away which I did not like in some way. These requested themes make it interesting for me, as I need to dive into the subject at hand and try and get inspiration from it. Themes can definitely be an interesting challenge, particularly if they're in a field you're not accustomed to. Would you say that your mods have a "signature look" to them? That is a yes and a no, I guess. I don't have a specific "thing" like always using aluminium or always using horizontal pipes or whatever. I try and mix it up as much as I can; I try and do something different every time I do a case mod, be it different angles or materials or tools or whatever. You can't really see a common thing about all of them, because I do them for so many different purposes. I always do aim to look for a clean way to create a case mod, though: I like to make cable routing holes and cover panels to hide holes and all things that take away from the case mod itself. Not saying I always succeed, but I try! I guess what you can see throughout my mods is that I do put a lot of effort into creating custom fan grilles. They are big surfaces that you can really use to give a case mod a specific kind of theme or look to it. I definitely remember your laser cut fan grills. The use of colour and the shapes can really add to the personality of a mod!